Inspired by European culture,AMOR PROFONDO has been committed to produce vintage and functional designed bags for both men and women. 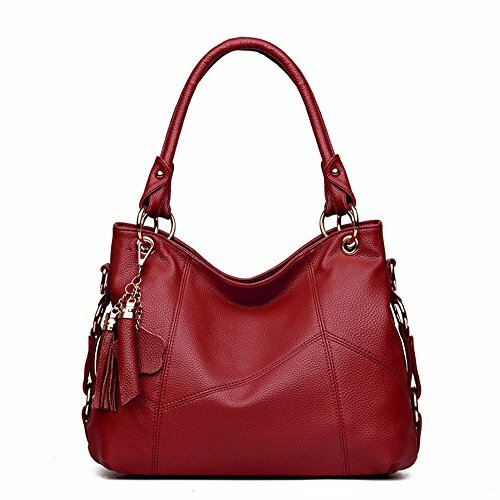 We advocate classicism, elegance and durability of our bags' design and production to provide pleasant user experience. "Not Just a Bag", our slogan expects to inspire people to explore new definition of fashion. We will continue to be in the pursuit and insistence of perfectionism and modern craftsmanship by making better bags for you, no matter you're headed to office, school or going off the grid. NOTE1 Due to different producing batches, there may be deviation of 0.04--0.12 inches for items. NOTE2 Colors on your computer monitor may differ slightly from actual product colors depending on your monitor settings. NOTE3 If you have any questions, please feel free to contact us, it will be our great honor to hear from you. [Material]: Top Grain Leather.Smooth zipper closure,High-quality cowhide tassel pendant. High quality Hardware. bronze interior polyester lining. [Scene]: It's Fashion, Vintage, Creative, is a very useful accessory brighten up your look, also as a gift.suitable for any age(Teenage or Adult Female) and any occasion(Traveling, Work Place , Dating, Shopping.). [Strap]:The bag is so special, in addition to a long shoulder strap, and attached a short-hand or a single shoulder strap;Convenient & Comfortable to wear in 3 ways: Tote, Shoulder and Cross Body. [DIMENSION]:15.7in(L) x 5.9in(W) x 11in(H),handle:7.9in.There is a long shoulder strap,it can be adjustable and detachable. If you have any questions about this product by AMOR PROFONDO, contact us by completing and submitting the form below. If you are looking for a specif part number, please include it with your message.